I would have given you my tips for watching this one in advance, as I did for that previous wedding, but since I was erroneously led to believe not great things about these nuptials, (by the idiotic press,) I did not. And that is most definitely my bad!!! I love this couple! 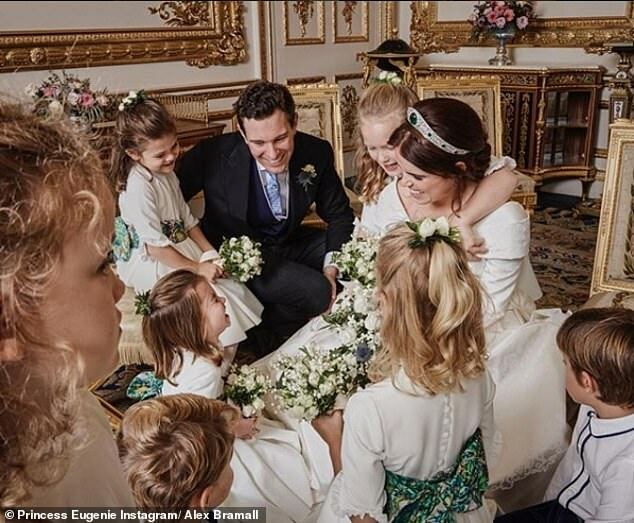 I had never noticed Jack at all in the seven years that they’ve been together, and I knew nothing of Eugenie except for the public mocking of her and her older sister, Princess Beatrice. I really am ashamed of myself for not digging deeper to begin with. The whole bridal family. And kids, too, of course. And it should not have been that way. The girls have always been secondary, (or actually, much further down than that,) to Wills and Harry, in the hearts and minds of the Brits. And I should not have bought into that. First of all, during the television coverage of the entire day, the English hosts played an interview that they had recently done with the engaged couple, who turned-out to be adorable. And soooo in love! Mr. X and I went nuts over how cute and charming they are. And they appear to be genuinely good people. We’ve been rooting for their happiness ever since that moment. And the wedding itself was beautiful and brilliant. 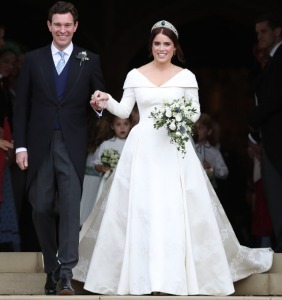 Eugenie looked stunning! Her dress, tiara, and earrings all worked together perfectly, (and with her auburn locks,) and were absolutely gorgeous. I adored that she did not wear an unnecessary veil, and had the dress made to show her back scar from her major spine surgery that she had when she was just twelve. What a very thoughtful thing to do to give others in her then-position hope. If a real-life princess can rock her scars, so can we all. I did have some unanswered questions along the way, though. Chief among them is why did Beatrice, who was the Maid of Honor, not stand up at the altar with her little sis, as Jack’s brother, his Best Man, did with him? 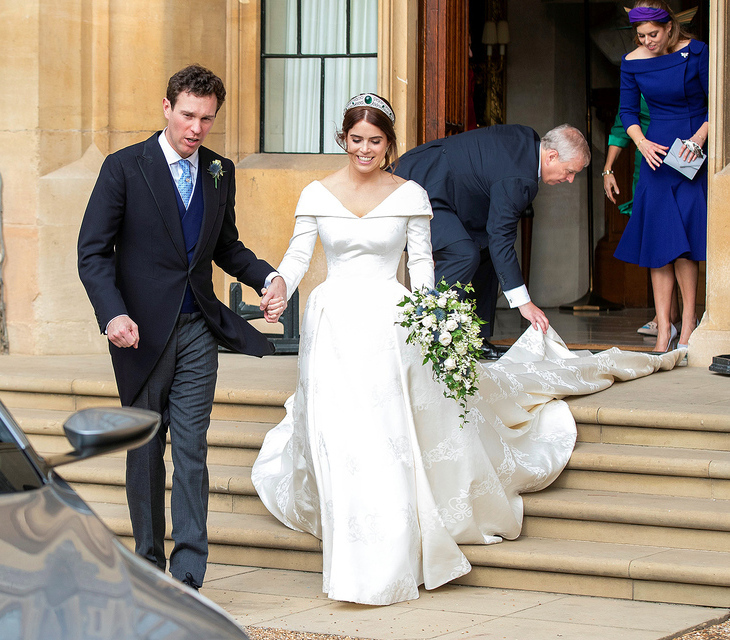 The only answer I can come up with is that she stayed by her mother’s side during the ceremony so that Fergie, who’s been persona non grata with the royals for many years now, would feel more comfortable. And, if that is indeed the case, yet another point for these lovely siblings. 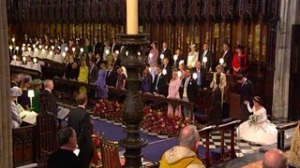 (L-R) Jack, Eugenie, Harry, Meghan. 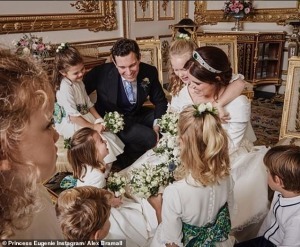 Eugenie’s BOUQUET is even better!!! 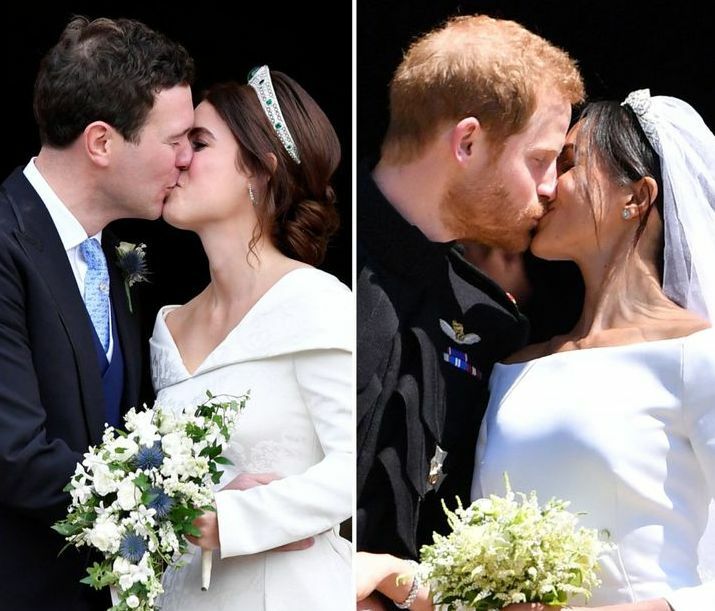 Not that it was a competition between the two weddings, (this one and the one five months ago of Prince Harry and Meghan Markle,) as the press has been making it out to be, but if so, this one won, hands down! It had a much prettier bride, no crazy self-serving bishop, (or whatever that guy was,) and no long drawn-out anything. Meghan’s hair looked dirty with her usual pieces hanging down, (which I have never understood her obsession with,) while Eugenie’s was clean, classy, and elegant. 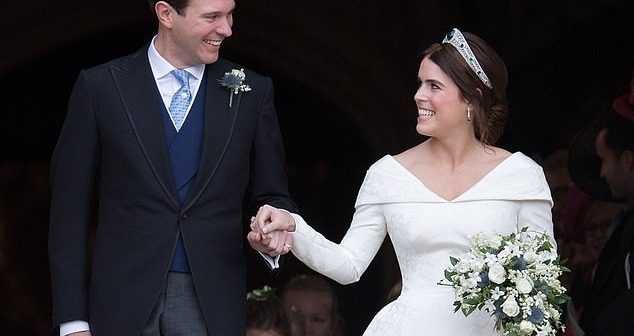 And her make-up was perfection while Markle’s face looked dirty and messy throughout the entire ceremony. And this couple interacted with each other more, laughing all the time, while I kept hearing Markle’s inner dialogue as just congratulating herself for snagging a prince! (Okay, that one is a large bit of speculation on my part.) They had a much better “first kiss,” as well! 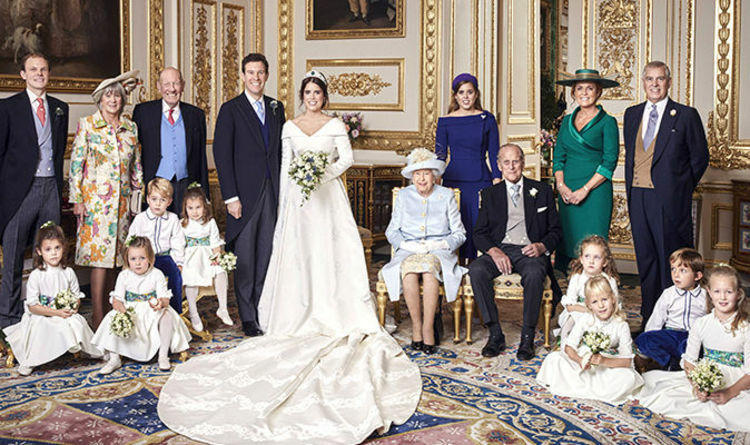 Eugenie’s curtsy, on the right. And let’s face it—that curtsy to the Queen that Eugenie did to her grandma was a thing of beauty! I’ve never seen one like it before! The kids in the bridal party were adorbs once again. But weirdly, they kept cracking us up at this one, while they did not at the previous union. 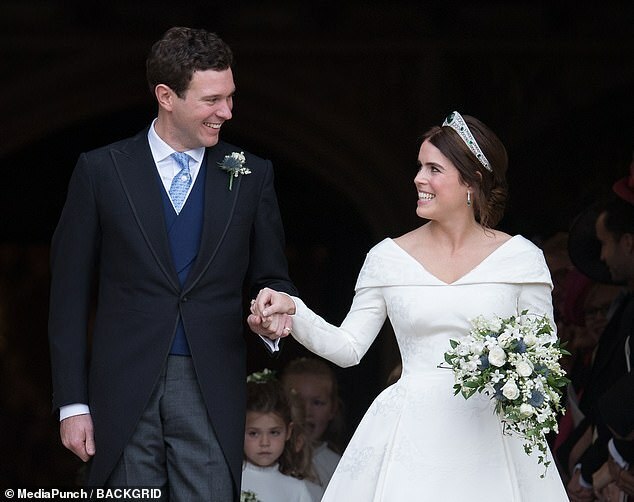 And then Eugenie and Jack threw exactly the kind of two-day celebration that I would love to do if Mr. X and I ever have a wedding. (But truth be told, none of our friends deserve this fun!!! Just sayin’.) First they had that enchanting wedding itself, followed immediately by a brunch, and a fancy dress reception that night, and then an outdoors fair-and-rides event the day after!!! OMG! And Eug and Jack’s cake beats Harry and Meghan’s by a million zillion! The latter had a lemon cake, (ugh—gag me with a spoon,) which, besides that I would have hated it, is not a fun wedding dessert, by any stretch of the imagination. It was not nice of them to give their guests such an unspecial “pudding.” [Note: “Pudding” is how the English refer to all desserts.] Lemon is the opposite of “sweet treat.” But Eug and Jack’s wowed their guests with a breathtaking rich cake of chocolate and red velvet, a combo made in heaven. 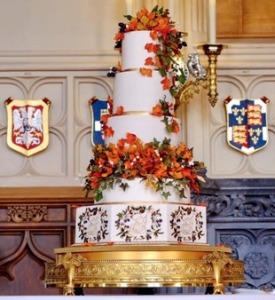 And it was decorated in autumnal foliage, which was their color scheme for the whole shebang. Brilliant! The cake. Notice their initials along the bottom. Now I really wish that I had accepted one of the several TV jobs I’ve been offered in London over the years, so Eug and I could have become besties!!! I would have fit right in with all of it! Part of that news is that Harry and his wife are expecting a child, (which I’m sure all observant females could tell the moment they laid eyes on her weirdly-buttoned coat that day.) So, good for them. 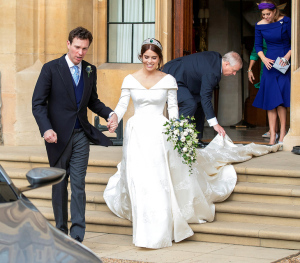 But it was totally rude of Meghan to announce her pregnancy…at Eugenie’s wedding!!! Talk about trying to steal someone’s thunder. Yeesh. Pippa and her husband walking into the wedding just three days before she had the baby!!! Looks like the easiest, neatest pregnancy ever! But creepy Meghan got one-upped herself right away by Pippa Middleton, (Kate’s sister,) having her baby on Monday, right after the other’s pregnancy news went world wide. I could not have been happier with that timing! And speaking of timing, how easy-going is Pippa’s?! She didn’t even show until very recently, looked comfortably and cutely pregnant at the wedding last Friday, went into the hospital on Monday, and had her baby…just three hours later!!! You go, girl. So, there you have it—the Royals week in review. With a twist of Karen, of course. Excellent observations and I agree with all of them! I am with you! This wedding, while still royal with all that goes with it, just showed LOVE from the smile on the bride, to the couple looking at each other during the ceremony. My opinion is the children in the bridal party could feel the warmth and love and were comfortable being, well, children!